Rasio Kemandirian Keuangan Daerah, Rasio Ketergantungan Daerah, Rasio Desentralisasi Fiskal, Rasio Efektifitas, Rasio Efesiensi. This study aims to determine the financial performance of the Kerinci Regency in 2008 to 2010. This type of research is type ofresearch that is Qualitative and quantitative descriptive, using secondary data, namely data sourced from the financial statements of district government of Kerinci that has been audited by the Badan Pemeriksa Keuangan (BPK) from 2008-2015. Analysis of the regional financial performance of Kerinci Regency is important information, especially for making policies in managing regional finances and asessing the government managed to manage its finances well. And has a positive impacton the welfare of the community. One of the measuring toolsthat can be used to analyze the regional performance of kerinci regency in managing regional finances is to conduct in independence Ratio analysis, Regional Dependency Ratio, Fiscal Decentralization Ratio, Effectiveness Ratio, and Efficiency Ratio. Keywords: Regional Financial Independence Ratio, Regional Dependency Ratio, Fiscal Decentralization Ratio, Effectiveness Ratio, and Efficiency Ratio. ABDALLAH, Zachari; MARYANTO, Maryanto. Evaluasi Kinerja Keuangan Daerah Pemerintah Kabupaten Kerinci. JAE (JURNAL AKUNTANSI DAN EKONOMI), [S.l. ], v. 3, n. 2, p. 66-80, sep. 2018. ISSN 2541-0180. 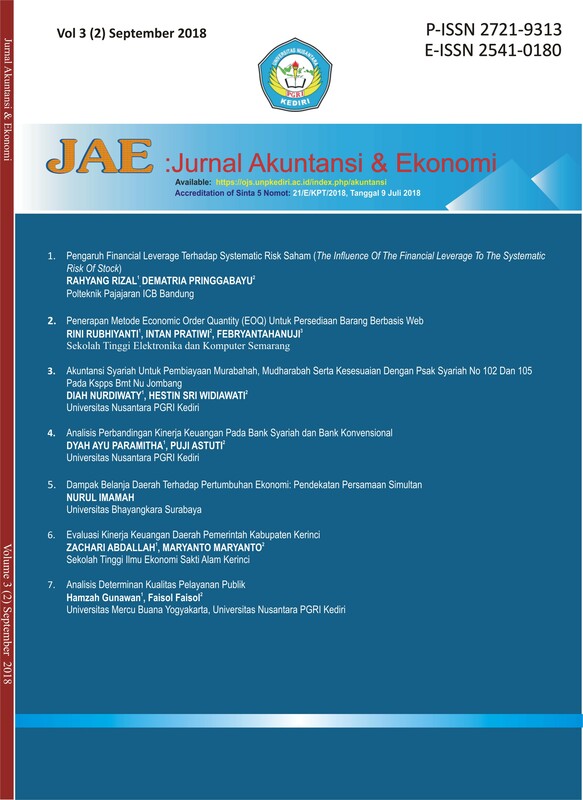 Available at: <http://ojs.unpkediri.ac.id/index.php/akuntansi/article/view/12470>. Date accessed: 24 apr. 2019. doi: https://doi.org/10.29407/jae.v3i2.12470.